I heard about FreedomPop’s new service offering on the radio the other day. Basically, you pay a deposit for a USB or HotSpot device, and they will give you 500mb of free data on that device each month. More data is reasonably priced, and if you ever want to get rid of it, you can send it back and they will refund your deposit. I decided to try it out. In addition, the good people at Slickdeals have set up an email exchange, with a list of tons of other people to invite; details here, or just go directly to the form. Note that you do not need to add the users to your gmail account; instead, on the FreedomPop page, you can go to “Earn Free” -> “Freedom Friends”, and below where it asks for your email address and password, there is an “Invite by Email Address” option, which lets you enter comma-separated email addresses. I decided to try the hotspot, and elected for the overnight shipping ($15 vs $5 for standard shipping.) I also decided to turn on the “FreedomPop Speed Plus” service ($2.99/mo), which according to their site, gives you “up to” 50% faster speeds (up to 12Mbps down and 1.5 Mbps up), prioritizes your data, and guarantees no speed caps or throttling. The device I got is on Clear’s network (apparently FreedomPop will add support for Sprint’s LTE network in the future), and appears to be identical to Clear’s Clear Spot Voyager, except with some custom firmware. It’s interesting that FreedomPop charges a $89 deposit for a device that is sold to Clear customers for $50. NetZero is also offering cheap 4G service via Clear, and they sell their hotspot for $50. The setup of the device is simple – turn it on, and connect to it with the SSID and password printed on the back. It’s trivial to change the SSID and password; in addition, if you plug the device into a computer via a MicroUSB cable, it exposes a USB network device, which puts you in the same network as the devices connected via wifi. Nice bonus, as this means with most modern operating systems you can connect it up and use it without needing drivers (it works out of the box on Linux too!) In addition, it supports “standard” NAT gateway features — you can set up static DHCP leases for certain devices, set up port forwards to an internal device (the device does get a public IPv4 address on the WAN side, hurray! ), etc. When it is connected to a computer via USB, you can also elect to turn off the wifi connection, or leave it on to share with others. I validated that they allow incoming connections too — port forwarded the SSH port to my laptop, and then SSH’d to a machine on the internet, then back to the hotspot’s public IP. I have read that port 80 won’t work – so don’t plan on hosting a web server behind one of these. Performance is actually better than what I expected. 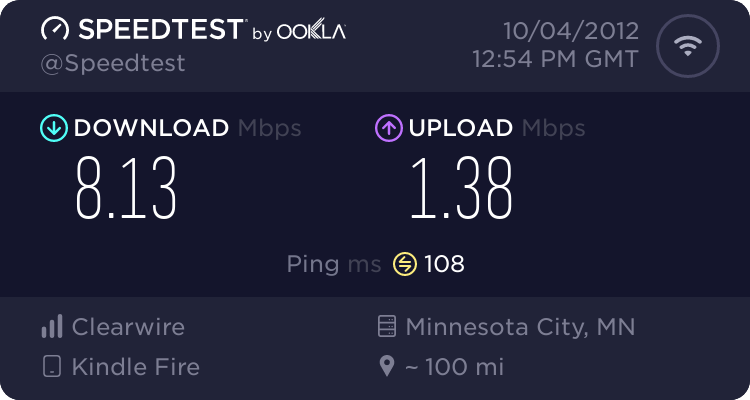 With my first round of testing at my office, my download speeds were generally between 8-11mbit and my upload speeds were between 1375kbps and 1511kbps. 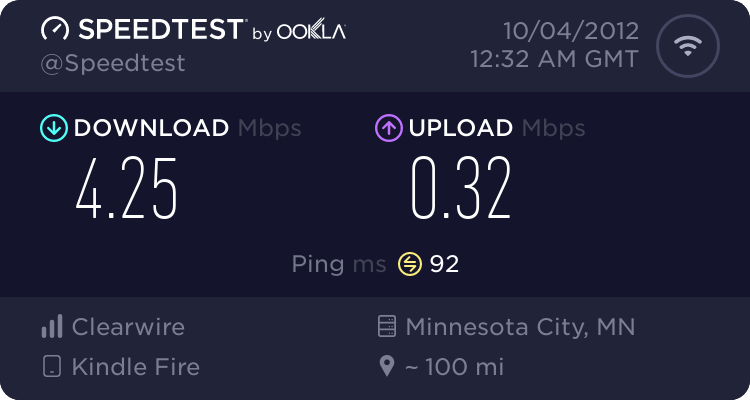 This is just south of downtown St. Paul (MN), with full signal strength. With my testing so far, I’d certainly recommend this service. It’s cheap, works well, and if you want a real 4G service plan, they are less than the mobile carrier’s alternatives. The one big downside is that this does only work on Clear’s WiMax network — there is no 3G/2G network as backup if you get out of the coverage area. So, check the FreedomPop coverage map and make sure they cover the areas you would like to use it. I do plan on testing out the USB version of this service; it seems like it’d make a great backup for my cable connection at home — as long as I ensure that streaming services are blocked when it is in use, don’t want to have the Roku streaming a bunch of stuff off Amazon Instant Video and run up hundreds of dollars in bandwidth bills! (Updated 2013-01-07): I ordered one of the USB devices shortly after I posted this review. It works just as well as the hotspot version – and additionally lets you pass the public IP straight through to the device. Unfortunately, my primary use location for the USB stick (as a backup for my home connectivity, which would mean plugged into a server in my basement) doesn’t get a signal at all (on either the hotspot or USB stick).. however, it would be pretty easy to route a small antenna outdoors from that location; if I get ambitious I might try it in the future. ;) If you’re a laptop-only use who wants mobile data, and don’t want to deal with another device with its own battery/etc, the USB route should work just fine for you! I’ve received the same public IP address every time I’ve used the device. I don’t know if this means that it is static, or if they use DHCP with a reasonable lease time. I left the hotspot turned on and sitting on my dashboard for my drive home. I noticed that whenever I was driving over 50mph or so, the connection seemed to drop.. however, when there was traffic and I had to slow down, and when I got off the highway, it kept a connection fairly consistently. Could be the area I was driving, or it could be that the tower handoff isn’t fast enough to handle moving that quickly. My house in Savage, MN. 2 bars of signal strength. W. 125th Street, Savage MN, between Joppa and Lynn. 5 bars of signal strength. W. 125th Street, Savage, MN, at Glenhurst Ave. 2 bars of signal strength. Burnsville McDonalds; north end of parking lot. Between 1 and 2 bars. Burnsville McDonalds; south end of parking lot. 3 bars. Burnsville Cub Foods parking lot. 3 bars. From my office in St. Paul, 5 bars. From a laptop over USB instead of a phone over wifi. I’m getting at most 6mbit down / 0.6 mbit up in upper manhattan. This is with the “speed plus” option. I’m wondering whether the Freedom Stick – Bolt / NetZero4G STICK / CLEAR Stick Atlas USB dongles can be used with a router that has USB and DD-WRT or Tomato firmware. I also work in St Paul, near the capitol, and have the usb stick in the mail. I’m excited. They used to ‘offer’ us wifi where I work but not anymore. There’s a lot of downtime on the job and it was nice to be able to jump online and get some homework done. Can’t wait till it gets here. I’ve been using the Photon hotspot for a while now and it’s been a great backup to have while I’m out and about to just check email, listen to some streaming music, or whatever. Only problem for me is the signal is pretty non-existent down in Shakopee where we currently live- but when i go just a bit north into Bloomington it works just fine. Freedompop just released 3G connectivity via Sprint this month with their new Overdrive Pro hotspot. I ended up returning my photon to get the $99.99 deposit back and then bought the $40 hotspot that has 3G and 4G. It’s actually the same hotspot I had for Virgin Mobile – although their service is closer to $35-40/month for the same amount of data. The Virgin hotspot that I just bought via Freedompop gets good coverage in my area on 3G, and Virgin uses the Sprint network as well, so I’m assuming I should have some decent 3G backup coverage with the new hotspot – plus I’ll save $60 on the hotspot. Nice! I saw the announcement for the new device, but hadn’t really looked at it yet. It looks like overages on cellular are a bit more expensive? Not a huge deal though. Yeah, i believe if you want 3G as the backup it’ll cost $3.99 month or something along those lines. Not free, but still reasonable. Nice to have the option in case I need it. I tried hooking up my karma wifi to my macbook directly with a micro usb cable… doesn’t show up as a network device. With my wifi disabled I now have no internet access. Seems like freedompop is a _clear_ choice over karma? I had a Photon that worked well. I am in Portland, OR. After walking around my house with the device I found the best signal (3 bars) from the back location and only if I placed it in a second story window. In looking at the Clear maps I can see why : I am just about equidistant from two towers and not in the primo shadow area of any tower. SIGH. I returned it to try the Overdrive which has 4G/3G. It was a disaster! It was “refurbished” and barely worked. It was terrible and never could keep a connection consistantly. Returned it soon after. I decided to go back to having a Photon. I am sorry I ever gave up the first one because they took away the full router capabilities that it had. You now get a VERY LIMITED setup web site in it. BOOHOO! Out of curiosity, I tried a similar Karma hotspot. The cost per GB is higher than FreedomPoP, but it uses the same Clear network. 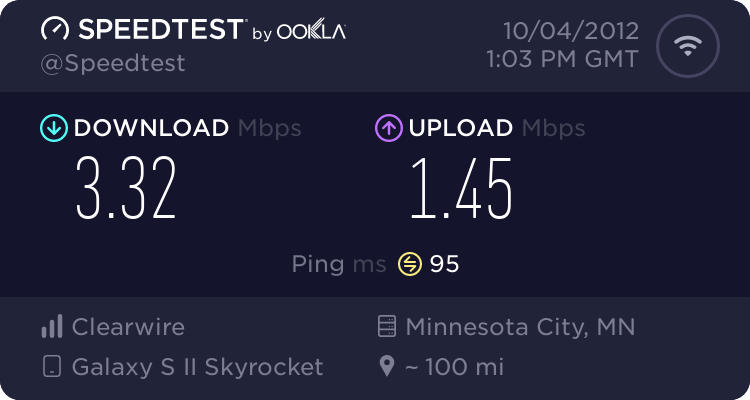 I drove around my neighborhood (SWMpls) with the hotspot on the dashboard, and it seemed that there was good coverage, except for anywhere within 1 block of my house. I _did_ find that it would pull-in a Clear signal if I left it in the garage. Even with the unit outside, the WiFi is still very usable inside the house. I also found another off-label use for it: providing internet access for an OBItalk using Google Voice (now, there’s a Widget Mashup!). Bandwidth requirements of VoIP are so low that it’s barely measurable as a cost. Hi, I’m not very tech savvy…I’m just wondering if Freedompop would be good for us. 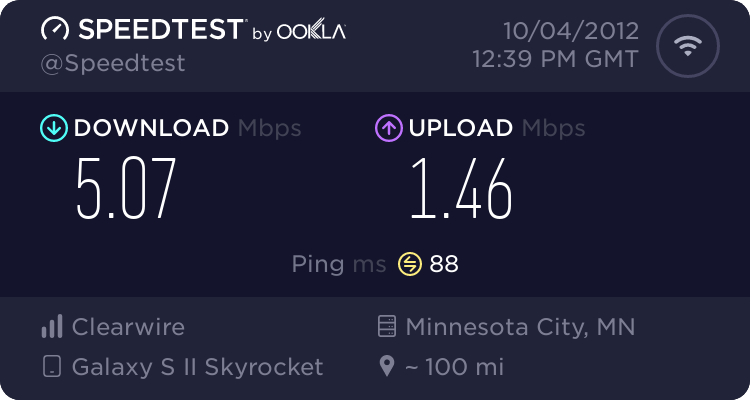 We use Roku for streaming and I need a decent mid grade internet speed for work at home (sort of equal to brighthouse mid grade 11.1 mbps download and 1.1 mbps upload. Do you think this would work? I’m in central Florida and I think the 4G is what is available. Freedompop really isn’t great for streaming/etc – the bandwidth limitations make it more expensive. You could certainly try it (it’s cheap to try), but I have a hunch you’d probably end up wanting to go back to Brighthouse. As far as speed goes, you’ll get somewhere close to 11mbit x 1.1mbit.. it may vary a bit, and the downstream may not be quite as fast, but it’ll be close. The latency and jitter over a wired connection will be better though.